“Who is Reece McLaren?” That was the question of the night during the ONE: SPIRIT OF CHAMPIONS fight week in December 2015 when he surfaced as Jordan Lucas’ late replacement to face Filipino-American sensation Mark “Mugen” Striegl. Striegl was supposed to have an easy night against a relatively-unknown Australian martial artist entering a high-profile bout on eight days notice, but McLaren begged to disagree and educated everyone about who he is and what he is capable of. McLaren pulled off a major upset in his promotional debut by submitting Striegl with a rear-naked choke in the aforementioned event’s co-headliner. Showcasing his never-say-die attitude, McLaren overcame a series of takedowns and a second-round knockdown against the highly-favored Striegl, but he methodically chipped away with stinging leg kicks. As his counterpart appeared to lose steam in the final frame, McLaren countered a weary takedown attempt with solid elbows before he advanced to Striegl's back to latch on the bout-ending choke at the 3:33 mark of the third round. After his impressive conquest of Striegl, the thousands inside the state-of-the-art SM Mall of Asia Arena were instantly introduced to the name of Reece “Lighting” McLaren. However, what actually shocked an additional number of Pinoy fans was the fact that he also had Filipino heritage like Striegl. The 25-year-old native of Gold Coast, Queensland revealed that his father, whom he never met while growing up, was Filipino. Even without the formal orientation to the culture of his father’s country, McLaren admitted that he always feels the sense of pride about his Filipino lineage. “My father is actually Filipino. However, I have never met him and never grew up with any Filipino culture. But I have always told people that I am half-Filipino. You can say that I’m proud to be Pinoy,” he said. Although ONE Championship gave him minimal time to prepare for Striegl, McLaren accepted the challenge because this was his chance to set foot on Philippine soil. “I had always wanted to come to the Philippines and Manila being the capital city. It was a chance I had to take,” he recalled. McLaren described his grueling encounter with Striegl as hitting two birds with one stone as it likewise raised his stock as a prizefighter. “I felt like this was my opportunity to get myself on the world stage. I also knew it would be my chance to get noticed. Mark is a very followed fighter with a massive fan-base,” he said. Being made public that he is half-Filipino, McLaren considers it as an achievement on his part as he has been the Pinoy youngster on his locale’s block. “I think it’s great. Growing up, I've been called it all the time. I was pushed down in the dirt many times, so getting recognition for being who I am was nice. I'm a proud Filipino kid,” he stated. McLaren made two trips to the Philippines in 2016, defeating Tajik prospect Muin Gafurov by way of unanimous decision in April before locking horns with Brazilian legend Bibiano “The Flash” Fernandes for the coveted ONE Bantamweight World Championship eight months later. 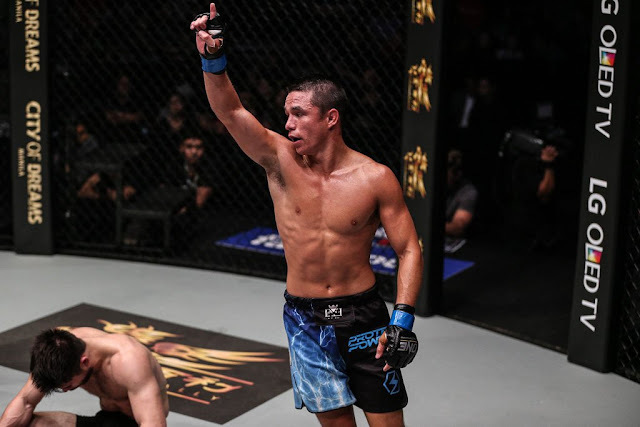 On the back of four consecutive victories, McLaren entered the biggest match of his professional career as he squared off with Fernandes inside the ONE Championship cage. McLaren believed that he did enough to become the new champion after five rounds of battle as he tested Fernandes like no one else in ONE Championship had done before, but it was not meant to be as he lost a narrow split decision to the reigning bantamweight kingpin. “I did not do enough, I guess,” McLaren lamented with eight months removed from the fateful decision. Known by the moniker “Lightning” due to his swift submission triumphs, McLaren has been patiently waiting for another chance ever since, yearning for another opportunity to showcase his elite abilities. McLaren sees a big reward if he plays his cards right against Kevin Belingon as both men are set to collide on the undercard of ONE: QUEST FOR GREATNESS in Kuala Lumpur, Malaysia on Friday, 18 August. While Belingon also yielded to Fernandes in January 2016, the Filipino knockout artist has recovered strongly by outpointing Muin Gafurov in October 2016 and then thwarting Toni “Dynamite” Tauru this past April. Both Belingon and McLaren desperately want a rematch against Fernandes, and the latter stressed that the winner of this highly-anticipated bantamweight contest should be next in line for the gold-plated strap. “He (Belingon) looks like he has good balance and good takedown defense on the cage. His stand-up striking is obviously phenomenal. We are the only two that have defeated the other bantamweights in the top five. We definitely deserve another title shot,” McLaren acknowledged. McLaren may assume the underdog role yet again versus a celebrated Filipino martial arts superstar, but if he once more proves his mettle and overcomes Belingon, then “Lightning” could very well get the championship rematch that he has been longing for. “Hopefully, the outcome of this bout will go to my favor, and we can do the rematch later. I would love a quick turnaround. I am ready. Let’s keep it going,” he emphasized. The 5-foot-6 submission specialist stressed that his back has always been against the wall in most of his matches, but he managed to rise to the occasion. “I've been the underdog most of my career. When we took the fight with Mark (Striegl), I was there to win. I didn’t take the fight just to fill in. I'm no pincushion,” McLaren shared. McLaren seeks to follow in the path of the tradition of Philippine combat competitors who exemplified the true spirit of a warrior inside the cage. “I have tremendous respect for all Filipino warriors. I tip my hat off to them. I am proud to say that I have the same warrior spirit in my blood because I am half-Filipino. In my upcoming bout, I am looking to personify that trait,” he ended.